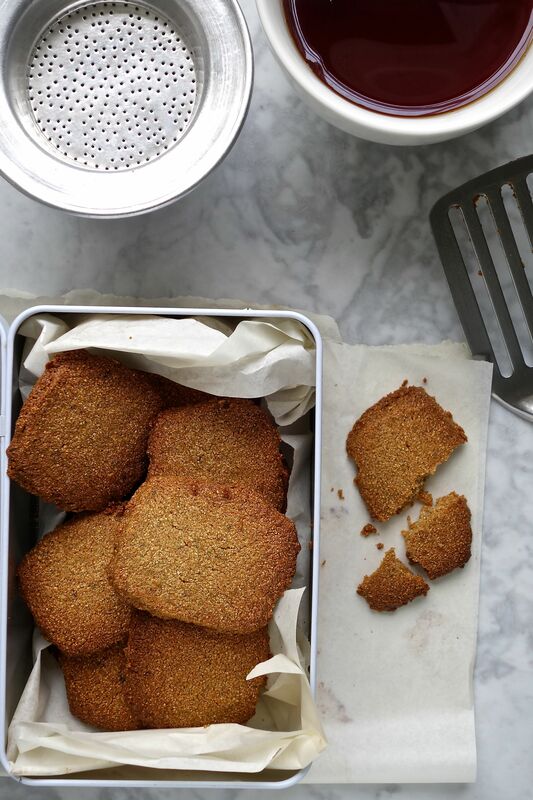 These delicious chestnut biscuits are similar to shortbread in texture and are very light and delicate, with a hint of ginger and spice. My mother, Siobhan, bakes this recipe as she is a coeliac, and when I first tried these I thought they were the perfect afternoon morsel to accompany a cup of tea. I have nothing against gluten or dairy, but these happen to be free of both, and are absolutely delicious in their own right. The method takes perhaps a little more work to keep the delicate dough together than with a traditional cookie, but it’s worth it for the beautiful chestnut flavour and the lightest, crumbly texture. If you don’t like the flavour of coconut oil, you can buy odourless coconut oils from brands such as Biona. Personally, I quite like the combination of the coconut oil’s natural flavour combined with the chestnut flour. I roll the dough out between two sheets of cling film, but you can also use silicone baking sheets or baking parchment for this purpose instead if you prefer. I use our Shipton Mill organic chestnut flour and our organic tapioca starch for this recipe. Place the dough onto a sheet of cling film and roughly shape in to a rectangle. Cover with another sheet of cling film and roll it out to 1cm thick using a rolling pin, keeping the edges to a rectangular shape by hand as you go. The reason for rolling it out between two sheets is because in the absence of gluten the dough is quite delicate, and this helps to keep it in one piece before baking. Remove the top sheet of cling film, and using the blunt edge of a knife, gently slice the dough into approximately 12 rectangles. Replace the top sheet of cling film to prevent the dough drying out, and place it on a baking tray. Refrigerate the dough overnight so that the chestnut flour slowly hydrates and softens, and the ground linseed has time to gel and bind. If you’re in a rush, you can shorten this process to 4-6 hours. You can leave the dough in the fridge ready to bake for up to five days. Line two baking trays with baking parchment. Take the dough out of the fridge, remove all cling film, and carefully separate the rectangles to leave room to spread whilst baking. I bake roughly six biscuits per tray. When you are ready to bake, pre-heat a fan oven to 170°C. Bake for 15 minutes, until the biscuits have browned at the edges and turned golden. When done, leave the biscuits to cool on the trays for a preliminary 10 minutes (the biscuits will fall apart if you try to remove them too early). Then, gently remove the biscuits directly onto wire cooling rack using a palette knife or fish slice, to finish cooling. They will keep in an airtight tin for a couple of days, but tend to soften with time.